The Midland Ancestor is our quarterly journal which is issued to members in March, June, September and December. once they are a year old. Some back issue years are now available as downloadable pdf files, priced at £2 per year(4 magazines). 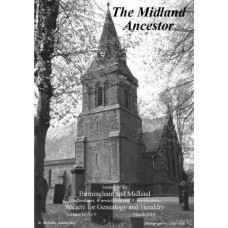 The Midland Ancestor is the quarterly magazine for BMSGH members Back issues for 2014 Volume 17 Nos. 13-16 Back issues are also available for.. 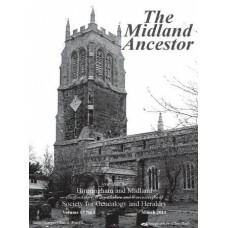 The Midland Ancestor is the quarterly magazine for BMSGH members Back issues for 2015 Volume 18 Nos. 1-4 Back issues are also available for n.. The Midland Ancestor is the quarterly magazine for BMSGH members Back issues for 2016 Volume 18 Nos. 5-8 Back issues are also available for n.. 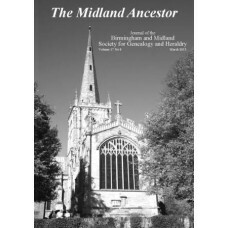 The Midland Ancestor is the quarterly magazine for BMSGH members Back issues for 2013 Volume 17 Nos. 9-12 Back issues are also available for .. 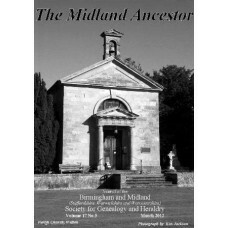 The Midland Ancestor is the quarterly magazine for BMSGH members Back issues for 2012 Volume 17 Nos. 5-8 Back issues are also available for n.. 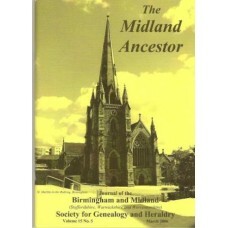 The Midland Ancestor is the quarterly magazine for BMSGH members Back issues for 2011 Volume 17 Nos. 1-4 Back issues are also available for n.. 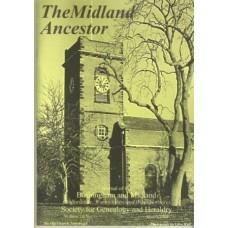 The Midland Ancestor is the quarterly magazine for BMSGH members Back issues for 2010 Volume 16 Nos. 9-12 Back issues are also available for .. 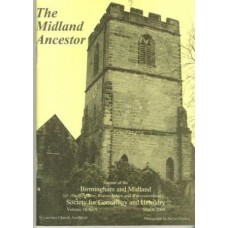 The Midland Ancestor is the quarterly magazine for BMSGH members Back issues for 2009 Volume 16 Nos. 5-8 Back issues are also available for n.. The Midland Ancestor is the quarterly magazine for BMSGH members Back issues for 2008 Volume 16 Nos. 1-4 Back issues are also available for n.. The Midland Ancestor is the quarterly magazine for BMSGH members Back issues for 2007 Volume 15 Nos. 9-12 Back issues are also available for .. The Midland Ancestor is the quarterly magazine for BMSGH members Back issues for 2006 Volume 15 Nos. 5-8 Back issues are also available for n.. The Midland Ancestor is the quarterly magazine for BMSGH members Back issues for 2005 Volume 15 Nos. 1-4 Back issues are also available for n.. The Midland Ancestor is the quarterly magazine for BMSGH members Back issues for 2004 Volume 13 11-12, Volume 14 1-2 Back issues are also ava.. The Midland Ancestor is the quarterly magazine for BMSGH members Back issues for 2003 Volume 13 7-10 Back issues are also available for non m.. The Midland Ancestor is the quarterly magazine for BMSGH members Back issues for 2002 Volume 13 3-6 Back issues are also available for non me.. The Midland Ancestor is the quarterly magazine for BMSGH members Back issues for 2001 Volume 12 11-12, volume 13 1-2 Back issues are also ava..